Water damage is never something to take lightly. Homeowners are all too aware that water damage can entail costly repairs, which may or may not be covered by insurance. Even if insurance covers the damages, it could take months for that to happen. In the meantime, the homeowner still needs to deal with the current problem. Allowing water to stand will only make things worse, so the quicker the response to better. Unfortunately, it’s not as simple as just grabbing some buckets and running a few fans. Serious water damage takes skill and proper equipment to remedy correctly. The American National Standards Institute (ANSI) sets the standards for water damage restoration processes, both in terms of safety and remediation. As such, they’ve also established the three main categories of water damage. Knowing more about them may help you to assess the relative severity of what you’re facing. 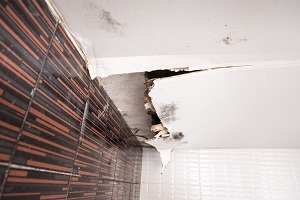 Water damage doesn’t just harm and endanger property. It can also be a hazard to you and your family. You’ll sometimes hear this referred to as “fresh water.” This originates from a sanitary source. That would be something which is potable and fit for human consumption. Common examples include sprinklers, sinks, and faucets. Natural sources are another common origin. It might instead come from rain or melted snow. This water doesn’t pose a threat due to ingestion, physical contact, or inhalation. This may be called “gray water.” This water has significant contamination. It may cause harm to humans if it’s ingested, or they otherwise come into contact with it. This type of water has unsafe levels of contaminants, such as microorganisms. It may have biological or chemical matter. The contaminants could originate from urine, detergents, or storage tanks. This is sometimes known as “black water” and it’s officially stated to be “grossly contaminated.” What does that mean? In short: it contains harmful toxigenic and pathogenic agents. The most common source for this water is raw sewage. It’s extremely hazardous, and not merely due to touch or ingestion. Inhalation is also dangerous and harmful. Natural disasters can produce this by combining sea or river water with heavy metals and pesticides. When you need assistance with water damage in Kennesaw, be sure to contact the experts. It’s not something to tackle on your own.